Hamby Home(in)stead ...: What's the buzz? While at the CERES Harvest Festival on Saturday, we chatted for a while with Lyndon about the bees he had on display. He suggested spring as a good time for acquiring a hive. Not only would the bees be busy then (and more manageable) but we could study beekeeping beforehand. There were flyers at the stand for classes and Erin collected one, thinking it might be an option for us (given Vaughan's interest in insects and our interest in honey)! A local beekeeping club runs regular meetings and classes, so I had been looking at those also. (The same club recently held a Bee Keeping and Honey Festival but we forgot to go)! All tentative bee-keeping plans have now been put on hold. 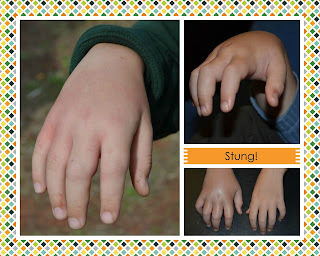 Vaughan was stung by a bee yesterday at school. By home-time his hand had swollen significantly. Further swelling occurred overnight (in spite of the recommended anti-histamine doses) and we attended a doctor this morning. She has prescribed anti-biotics and a cortisone fluid. We are to monitor the hand/arm for colour change or increased swelling - all indicators that a hospital trip is necessary. Hopefully the medications will have the desired effect and the swelling will have reduced by this evening, though we will return to the doctor tomorrow in any case. So much for our vague plans of becoming apiarists! In the circumstances it is probably best we mind our own beeswax - and leave the bees to mind theirs!